Today is the 300th anniversary of Madame Sarah Derby’s birth and a good time to post about a woman whose name looms large in Hingham history—and legend. Born Sarah Langlee, daughter of a Hingham tavern keeper, she married well—twice. Her first husband was Dr. Ezekiel Hersey, a prominent and affluent Hingham physician. After his death, she married Richard Derby, a wealthy ship captain and merchant from Salem. (Richard Derby built Salem’s Derby Wharf in the 1750s.) She outlived Captain Derby as well and returned to Hingham to live on the large farm she inherited from Dr. Hersey. Local legend created from this a “rags to riches” story (in their Hingham history Not All Has Changed, Francis and Lorena Hart dub Sarah Derby “Hingham’s legendary Cinderella”): a beautiful young girl growing up poor on the islands of Hingham Harbor, whose names—Ragged, Sarah, and Langlee—described her as a young girl. Edward Rowe Snow, in his History of the Harbor Islands, put to rest the idea that the islands were named after “ragged Sarah Langlee,” however; these islands bore those names on nautical charts as early as 1700–well before Sarah Langlee was born. But her portrait (made in later years) suggests youthful beauty, as do perhaps the two good marriages. 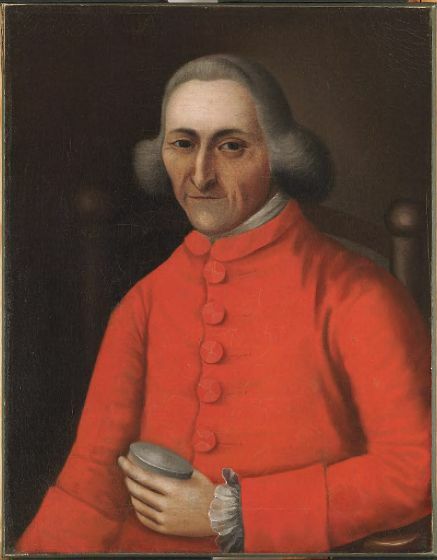 When he died in 1770, Ezekiel Hersey left his substantial estate to his wife on the condition that she give £1000 to Harvard College. Sarah Derby added to this her own bequest in the same amount, and together their gifts endowed the Hersey Professorships of the Theory and Practice of Physic and of Anatomy and Surgery at Harvard, laying the foundation for the establishment of Harvard Medical School. She remarried, to Captain Richard Derby, in 1771. It is also a common misconception that this second marriage is what made her a wealthy woman. 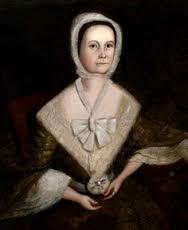 In fact, she waived her dower rights when she married Captain Derby, who left his fortune to his family and bequeathed to Sarah Derby only an annual income (and two slaves, also commonly glossed over in legend). When she returned to Hingham in 1783, Madame Derby was persuaded to endow a new school for Hingham. The school would be co-educational (one of the first co-educational schools in the country) for the instruction of boys “in the Latin, Greek, English, and French languages, and the sciences of Mathematics and Geography” and girls “in writing, and in the English and French languages, arithmetic, andthe art of needlework in general.” As discussed in a prior post (“A Trip to the Principal’s Office—in 1799”), a single preceptor had the charge of both sexes, although a “sensible, discreet woman” taught the girls their needlework. 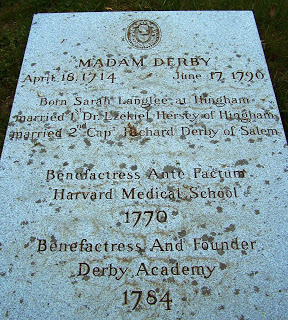 Madam Derby died in 1784 and is buried in Hingham Cemetery, not far from the site of her school. She provided further funding for the school in her will and instructed that her clock and her portrait (the one appearing at the top of this post) be placed in the school building. The original school building was replaced, in 1818, by a Federal-style structure—Old Derby Academy, current home of our Hingham Historical Society. 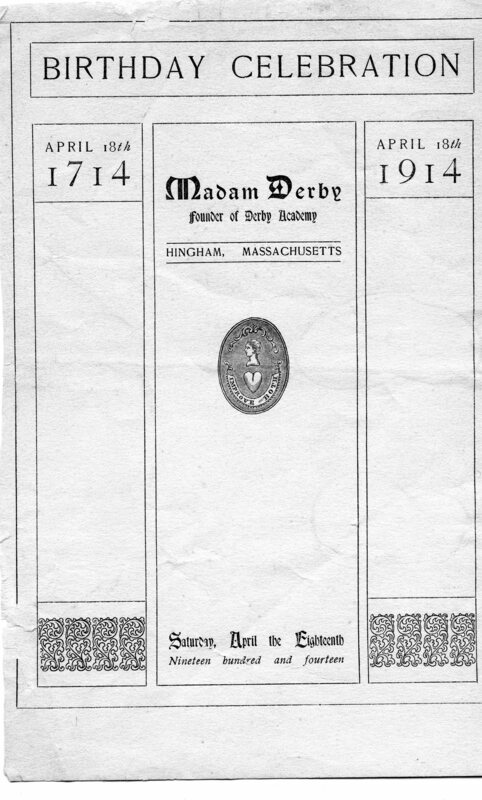 One hundred years ago today, on April 18, 1914, the Town of Hingham joined Derby Academy in celebrating Madame Derby’s bicentennial. A “Birthday Celebration” was held in her honor at Loring Hall. 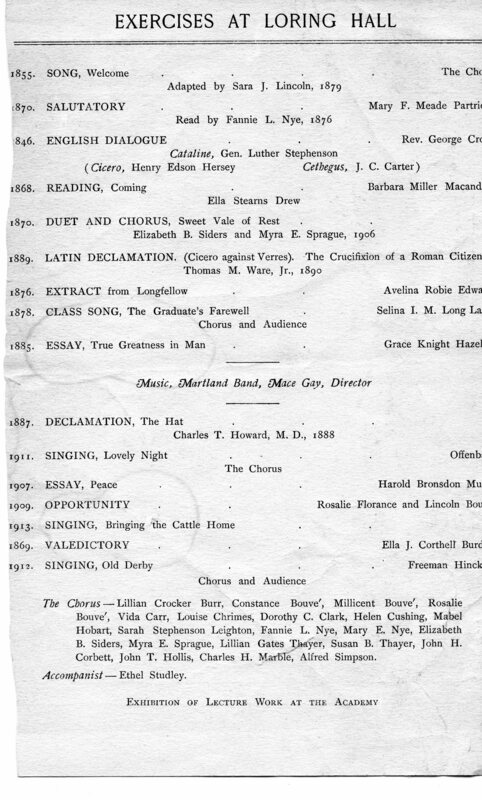 The program for the evening’s entertainment, preserved in our archives, included a local chorus, the Martland Band, from Brockton, English and Latin declamations by alumni, and poetry, essays, and other literary and musical offerings. This entry was posted in Uncategorized and tagged Derby Academy, education, Harvard, Hersey family, Hingham Historical Society, Loring Hall, Sarah Derby, women. new iphone! Just wanted to say I love reading through your blog and look forward to all your posts!